There is a growing recognition that although shooting often is certainly preferred to infrequent shooting, it’s probably more important to ensure that teams are shooting from the best shooting locations. This point has been touched upon in recent days by both Zach Slaton (LINK) and Richard Whittall (LINK). Indeed, if you had to assign a single reason why Man United won the Premier League last season then I would suggest you could possibly find the answer in the fact that they were able to fire off so many of their shots from these Prime locations. Shots from far out have a lousy goal expectation; sometimes not even as much as 1%. Teams want to be shooting from close central positions and preferably preventing the opposition from doing the same. I record the shots that Premier League teams gain and concede and one of the methods I use to represent this data is to analyse the shots into four zones. To save me typing a lot of surplus words the image below gives a pretty clear representation of the four zones as well as the boundaries for the zones. At various times during the season I will do a piece on a particular team’s shooting locations but in this one I thought it would be good to get a summary snapshot of the shots in Prime locations, both for and conceded by each of the Premier League teams. The importance of Prime location shooting can’t be overstated. Very simply if you don’t shoot enough of your shots from this zone you’re going to struggle as the Goal expectation for shots from this area is much higher than any other shot. The horizontal axis represents the amount of shots that teams have gained in the Prime zone, and the vertical axis the number that they have conceded. It is clear to see that two teams are visually being left behind after only 6 games – Fulham and Crystal Palace. Pretty much everyone expected Palace to struggle, but for most it’s a surprise to see just how rubbish Fulham have been so far this season. During the International break, after 3 league games were played, I took a look at the stats at that stage and I flagged up the fact that Fulham appeared to be heading for trouble. That article can be found here (LINK) and nothing has happened that would make me change my mind in this regard. They have conceded almost 50 Prime shots, and only racked up 13 of their own. I would suggest that the 18th position they occupy in the league is actually flattering them. They have been truly rancid at both ends of the pitch and have allowed 10 more shots from Prime locations than any other team in the league. 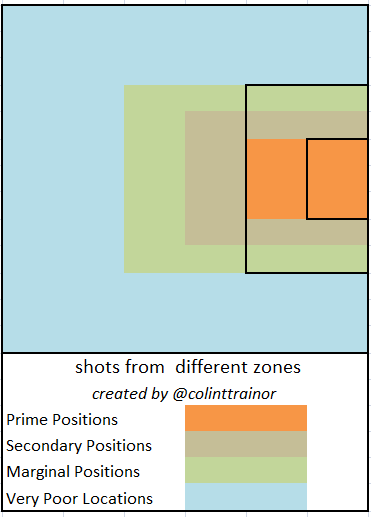 122 shots is a huge amount to concede in just 6 games, and it is made worse by the fact that 40% of them were in the Prime zone. Crystal Palace’s woes are attacking related. On the defensive side they could lie amongst a host of other teams, but their creation of just 9 shots in Prime locations is the reason for their position alone on the left side of the chart. The general consenus is that Aston Villa have played above expectation in picking up 9 points from a tough set of opening fixtures as they nestle in the middle of the league table. I am less satisfied with their performance. They have led a charmed life to have only conceded 8 goals (with one of them being an OG) based on the chances they have given up. Their numbers suggests that they have been very fortunate to pick up as many points as they have done. Indeed their victory against Man City was achieved by scoring 3 goals despite a very insipid attacking performance – unless they improve I would expect the see the Midlanders fall down the league table over the coming weeks. OK, so it helps when one third of your league goals have come from penalties, as has been the case with Hull. Those penalties have been more than welcome on Humberside as it appears that they don’t deserve, at least on this metric, to be occupying a top half league position. United’s league position of 12th is a pretty true reflection of their standard this season; there can certainly not be any complaints that they have been unlucky with the results they have achieved. Who would have thought that they appear as if they are a mid table team, surrounded by the likes of Norwich, Swansea, Stoke and West Ham? Liverpool’s defensive style employed during their opening few games certainly doesn’t help their ranking position in this measure. This is clearly seen by the fact that even though they are second in the actual league table they are outside the best performing top half dozen teams according to this metric. It appears that Mignolet has been a very important acquisition for the Anfield club as Liverpool have conceded just 4 goals so far. 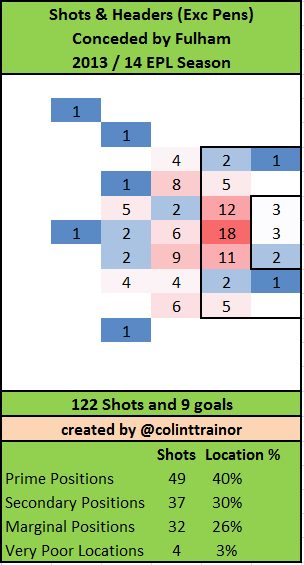 The amount of shots conceded in the Prime zone would lead to an expectation that the Belgian would have been beaten more often than has actually been the case. Upon taking the lead in their opening 3 games they created nothing of note. Perhaps the introduction of Suarez may kick them on and they will create more clear cut opportunities, permitting them to join the top 6 teams. These leading teams that have developed a little gap from the rest and can all be found towards the bottom right corner of the chart. Spurs have continued where they left off with last year. Their defence and their ability to prevent shots from the best locations has been immense – in 6 games they have allowed just 14 shots to be struck from the Prime zone. Let’s jump back to Fulham for a moment. Defensively they have been so bad that they have actually conceded more shots from Prime locations than Tottenham have total shots; it’s hard to believe that they are playing in the same division. At the other end of the pitch it’s also like the 2012/13 season never ended. Although they comfortably lead the league in the number of shots taken, at 115 excluding penalties, they have only mustered a miserly 28 of them from Prime locations. 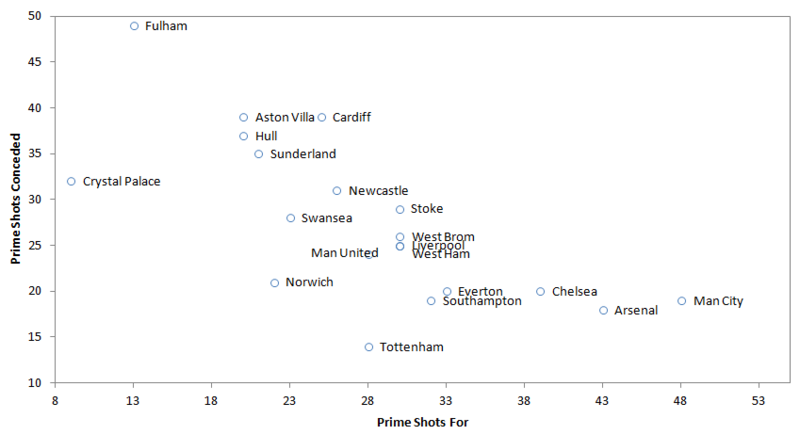 9 teams have had more shots in Prime Locations than Tottenham despite have much less shots. 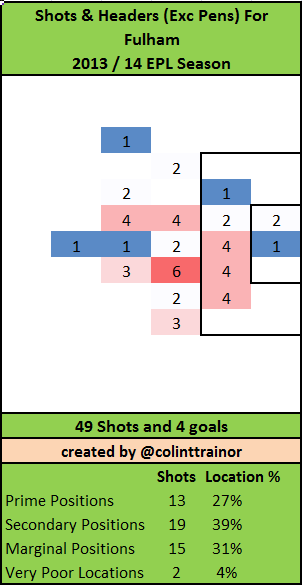 Incredibly, despite have 50 shots less that Spurs, Stoke actually managed to have two more of their shots from within the Prime zone compared to the North London Shot Monsters. No doubt that the Saints are the surprise name appearing amongst the leading six. They want to play football the right way, and they are getting the results that their performances have deserved. Their lofty league position of sixth is a fair reflection of their quality thus far. So over the space of 5 league games Arsenal have gone from being in the middle of an emergency to emerging as genuine title contenders. It’s amazing the impact that one German can have in England. The introduction and integration of Mesut Özil, as well as the form of Giroud and Ramsey has (almost) deservedly sent Arsenal to the top of the league table. By this measure, Man City are the best team in the league and some very poor fortune / defending (delete as appropriate) means that they currently sit 7th in the league table. Offensively, with 48 shots from Prime Locations they are almost 1 Prime shot per game ahead of Arsenal in second and 1.5 Prime Shots ahead of Chelsea in third. On the basis of these numbers it’ll not be very long until City begin the climb to a more deserved league placing. Their lowly placing is due in part to the fact that they have performed badly in keeping out the relatively few very good shots they have conceded. I would expect this situation to reverse, unless Joe Hart is a major part of that reason. I’m a charitable sort, so for the time being I’ll peg it down as being due to variance until a bigger sample of games have been played this season.